Haryana Chief Minister Bhupinder Singh Hooda today opened the floodgates of pre-poll sops, liberally doling out please-all incentives at the Congress' Haryana Shakti rally in the town. 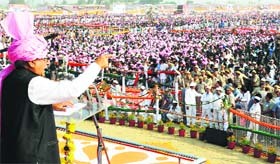 The 99-acre plot, chosen for the venue, was full to its capacity, emphatically underlining Hooda's political management. In a move which upset India, Sartaj Aziz, Pakistan Prime Minister Nawaz Sharif's Adviser on Foreign Affairs met Kashmiri separatist leaders on Sunday shortly after his arrival here for the 11th Asia-Europe Meeting (ASEM). Prime Minister Manmohan Singh has written to Sri Lankan President Mahinda Rajapaksa, explaining his inability to attend the Commonwealth Heads of Government Meeting (CHOGM) to be held in Colombo next week. 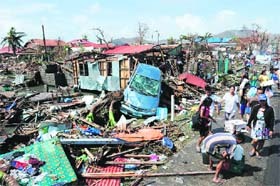 Residents walk past debris and destroyed houses along a road in Tacloban City in central Philippines on Sunday. Chief Minister Raman Singh and his three ministers are among the candidates whose fate will be decided tomorrow when 18 Assembly constituencies in the worst Naxal-hit regions of Bastar and Rajnandgaon go to polls amid heavy security in the first phase in Chhattisgarh. The Special Tribunal headed by Justice Kuldip Singh has revealed that in Kansal village, adjoining the Union Territory of Chandigarh, the public lands which certain people purchased at throw away prices had been illegally mutated following the orders of revenue officials and some of which were later sold at exorbitant rates.